Daily nutritional supplement to alkalize your body’s pH, maximize energy and optimize health. Wholesome and complete Whole Food meal replacement or snack. Pre workout endurance enhancing drink to stabilize blood sugar levels, re-invigorate your entire body and prepare you for exercise. Beneficial part of a weight management, detoxification-cleansing program when directed by your healthcare provider. 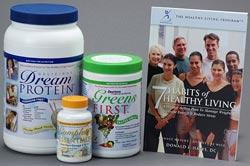 What Is The Greens First Meal Replacement Kit? Each Greens FIRST Meal Replacement Kit contains a can of Greens FIRST, Dream Protein, in vanilla or chocolate flavor and a bottle of 120 Complete Omega-3 Soft Gels. The Greens FIRST and Dream Protein can will last for one month, the 120 Omega-3 Soft Gels for 2-4 months. Simply mix a scoop of Greens FIRST and Dream Protein in 6 to 8 ounces of water or your favorite beverage in the Convenient Shaker Cup and take one Omega-3 Soft Gel in the morning or anytime! The 7-Habits of Healthy Living Book provides easy guidelines on healthy eating choices, exercise plans and tips to reduce stress and put balance back into your life. Our clients report a 4-7 pound weight loss in one month after using the Greens FIRST meal kit as their breakfast replacement. A one month supply costs $122 and if only taking one Omega-3 Soft Gel per day, the cost is $3.40/day. If used as a breakfast replacement, those $3.40/day will provide more nutrients than most people would be able to buy for this amount for breakfast! Try it for one month!